Edison Pen Co – The Edison Menlo is Goldspot’s Pen of the Year, 2013! The Edison Menlo is Goldspot’s Pen of the Year, 2013! 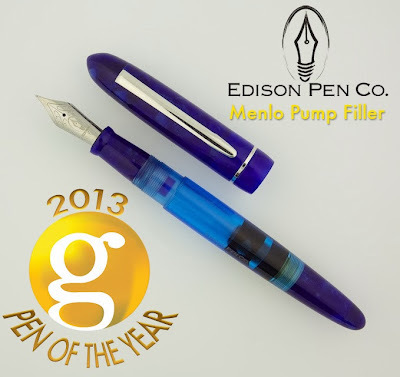 I’m very proud to announce that The Edison Menlo Pump Filler won the Goldspot Pen of the Year, 2013! And not by a small margin, either! The Menlo won by 57%! You can see details and Goldspot’s announcement here. Thanks to everyone who voted! So in the last three years, the Huron was nominated for a Pen World Reader’s Choice Award, the Collier won Goldspot’s Pen of the Year 2011, the Beaumont won Goldspot’s Pen of the Year 2012, and now the Menlo Pump Filler Won Goldspot’s Pen of the Year 2013! That’s three years running for Edison in the Goldspot polls! Again, thanks to everyone for voting. Next week when we take a break, we’ll have one more item to be thankful for! I thoroughly enjoyed the video showing how the Menlo Pump Filler was made, and was particularly surprised to see the “dental tool’ used in the process of polishing the inside was exactly the same tool that my dad used more than 60 years ago when he was making false teeth. And I used the same tool to polish the ports on the intake manifold of my 1949 Cadillac. If you were in Atlanta I would apply for a job, but at 75 I’m probably too old to start again. I inherited a Parker 51 made in 1946 from my dad, and I still have a Parker 51 from 1950 that was given to me when I graduated from 6th grade. I’ve just renewed my interest in Fountain pens and found you through an SBREBrown video. Thanks Bob! I LOVE that dental tool that we use! It actually was used by my mother ever since I was about 5 years old. She used to do acrylic sculpture nails in a small studio in our home, and she used that that tool everyday. So the tool is at least 35 years old, still being used daily, and still working like a champ! I could get a Foredom that would take up less space, but that tool has a lot of sentimental value to me! There’s also something to be said about tools that were built to last!